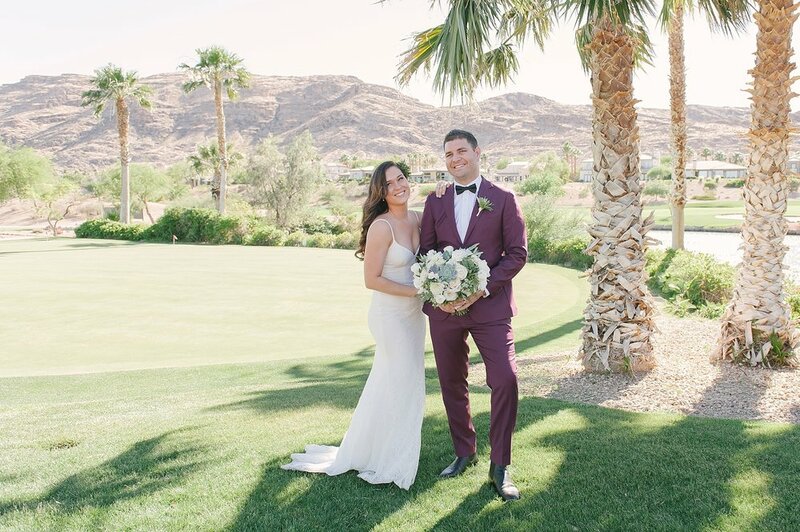 Gemma and John traveled all the way from Australia to have the ultimate destination wedding in Las Vegas and traveled along the U.S. west coast and Mexico to celebrate! I just love it when couples have epic travel adventure honeymoons! But, not only did they travel to Vegas from Australia, but so did 40 of their closest friends and family! I don't know about you, but to me, when people are willing to travel such a long distance to witness your wedding, it must mean you are oh so loved! Or, maybe you just really love to travel...nah, I'm betting on love. I'm sure of it actually, because after getting to know Gemma and John ourselves we can totally see why they are loved by so many! Gemma was able to plan an amazing wedding day at Red Rock Country Club with the assistance of Gina, Director of Catering extraordinaire and everything turned out brilliantly! We met up at Red Rock Country Club and arrived while Gemma was getting the finishing touches to her hair and makeup by the team at Ruby Finch Salon, who do an amazing job and are so just the sweetest ever! Since they decided on not doing a First Look, Jason and I photographed them separately before the ceremony and then we did the Bride and Groom formal portraits after! Once we were all done with photos, it was time to go in for their reception, which started off with some really heartfelt toasts, yet another testament to how much these two are really loved! Justin and Jessica came to Vegas for a long weekend getaway from San Antonio, TX! Little did Jessica know this weekend would change her life! Justin contacted me a week before he was planning to propose to Jessica and "lucky" for him, I had availability. He had set up an hour session at the Neon Museum, split between 30 minutes at the North Gallery and 30 minutes in the new Boulevard Gallery. So, for all the other proposal shoots I've done, they've had no idea their boyfriends had booked me, so I had to pretend I was just a tourist on the strip with a nice camera. No biggie! In this case, due to the location, I couldn't be kept a secret. So, Justin told Jessica that he'd booked a photo session for them at the Neon Museum, so I was totally expected. Now, you might be thinking that Jessica should have thought something was up, right? I know I did! But, turns out (and I found all of this out after he proposed!) Jessica had been wanting to do a destination photo shoot with Justin for awhile now! She'd brought it up before several of their other trips together and Justin always declined. So, she just saw this as his way of finally giving in and showing her just how much he loves her. Well, obviously Justin really really loves Jessica because, unbeknownst to her, he was planning to propose. I told Justin I'd shoot for a few minutes and then ask if they had any specific poses or shots they wanted to get. That would be his cue! Justin said he had one and Jessica looked a little puzzled. I mean, he's never wanted a professional photo shoot and now he had ideas on poses?!? But, before she had too much time to think, Justin was already on bended knee, going for the ring box he had discreetly placed in his sock and asked Jessica to marry him! You guys!!! It was pure perfection! Looking at these photos, I think you can guess her answer! I had such a blast with these two and it felt like we could just keep hanging out all afternoon. Well, I'm sure they were ready to get rid of me and just enjoy being together and engaged in Las Vegas alone ;) Congrats, Justin + Jessica!!! Proposals are quickly becoming one of my favorite moments to document! The excitement and planning leading up to it, the gush of emotions that follow, the pure joy and happiness at that moment. These are all the things that I love and live for. So, gentlemen, when you're planning to propose to the woman of your dreams, you really need to work with a photographer, preferable me (wink, wink! ), to help bring your ideas to life with suggestions on locations, time of day, logistics, and so on! Believe me, it will be so worth having that moment documented professionally! I pinky promise!! Charles contacted me just a few days before he was planning to propose to Elyssa. They were coming to Vegas from Canada for vacation and he wanted to get it right! This was Charles' first trip to Vegas, so he needed some ideas, which I was more than happy to provide! We settled on the location and then Charles had to work hard to convince Elyssa to get ready for their night out a little earlier than planned. Luckily, he made it work and pulled off an epic surprise proposal! Just look at these images!!! Once I introduced myself and Charles explained how he'd been planning this for a bit, we took a walk around the strip to get some more epic images of the newly-engaged love birds! I just love how Elyssa was so excited to share the news with her mom, she had to FaceTime her right then and there! It was my 2nd favorite moment of the evening!!! We hadn't planned on walking by the Bellagio fountains as they were about to start, but it worked out perfectly! Maybe it was a sign of how wonderful the day had turned out to be!